I have to admit I completely forgot about beauty boxes over Christmas, I didnt even notice the money come out my account for this! Was a surprise to see it turn up the other morning! 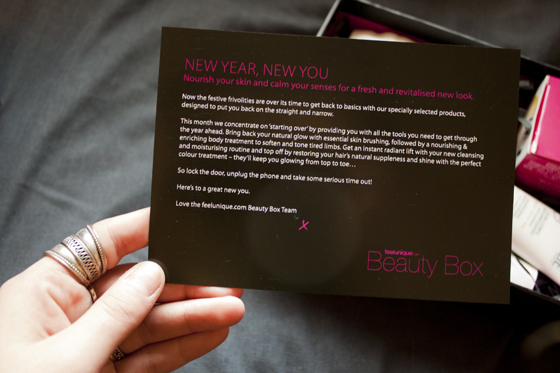 This is the first beauty box of 2012! Its a OK box to be honest, not super exciting but decent. I love all the Caudalie things I've tried so far so I cant see this being any different! I've been wanting to try Phyto as a brand for a while but its the kinda thing I'd probably not shell out the extra pennies for! I dont even use conditioner on my hair so maybe this will turn me! This Works is a brand Im in two minds about, something that claims "this works" to me suggests it probably doesn't, but I'll give it a chance! Missed out of the bath salts in previous boxes so I do want to try those! The Lirac Cream has gone to my mother who was looking for something like that to try! Overall its a OK Feel Unique beauty box like I said earlier. Its the type of products I'd rather see in a beauty box. I don't like getting make up as I'd rather choose that myself. Skincare and haircare are my main intrests in things I'd personally like to try as I tend to not really buy them myself and always stick to the same brands if I do. I feel like this box isn't as "wow" as the other boxes, but I do like Feel Unique and will continue to be subscribed for the neat future! I wish everyone didn't complain about perfume samples as I REALLY miss them! I love trying new scents! I like the items, I´m excited for mine to arrive now! I really want to try the salts- it's the item in the box that I'm finding the most appealing. My box was dispatched really late this month (yesterday) so I'm still waiting for it to arrive. KMT. You don't use conditioner!!! How is that possible?! I wouldn't even be able to put a brush through my wavy hair without regular conditioner use. 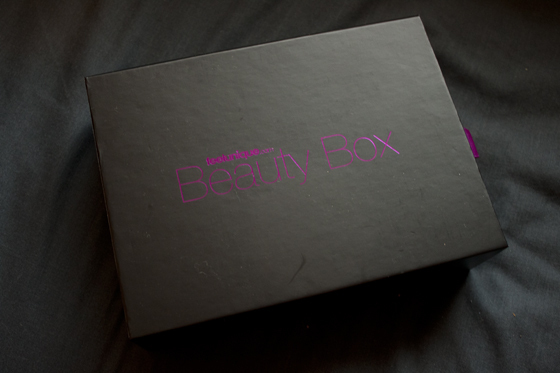 I need to get on the list for these beauty boxes though, there's one in the states called the Birch Box that is pretty similar. (ie nail varnish) and maybe something totally new. I felt this box was a bit of a let down in terms of what I hope for in a beauty box. It wasn't a showcase of new products to the industry. It felt a bit thrown together as a last minute thought after the rush of Christmas, which is disappointing given the resources Feel Unique have access to. I hardly use conditioner either, though I have been using an Aussie 2in1 recently! 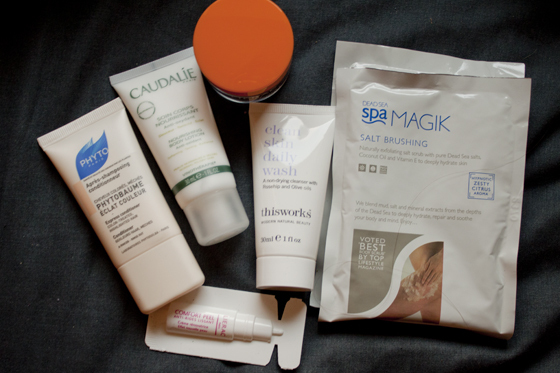 I don't get beauty boxes, they seem good value & a way to try new things. Maybe once I decide on one.. it's always mixed reviews! oooh so excited for my box now :) love perfume samples too, especially cos perfume's are so expensive, they're one of the main things people would want to sample first, surely! Looks like an ok box. I really want to subscribe to a beauty box, but I'm still not 100% sure if I want to spend $100+ a year on them. Bah i thought it was kind of a rubbish box.. I got body lotion which is always boring, and two types of anti wrinkle cream- im 20! The body salts I had already received in a GlossyBox before I changed to FeelUnique. I don't see why they include age-specific items? Anyway, I'm looking forward to trying the conditioner and cleanser if nothing else!